I took a white panel which is die-cut using Lawn Fawn small stitched rectangle; then stamped the snowmen using black ink and colored them using Prisma Colored pencils and gamsol, I also colored the background using a light color. Then I took the snowflakes stamps included in the set and stamped it randomly on the panel using Delicata Golden Glitz ink. I layered the white panel onto a red cardstock. 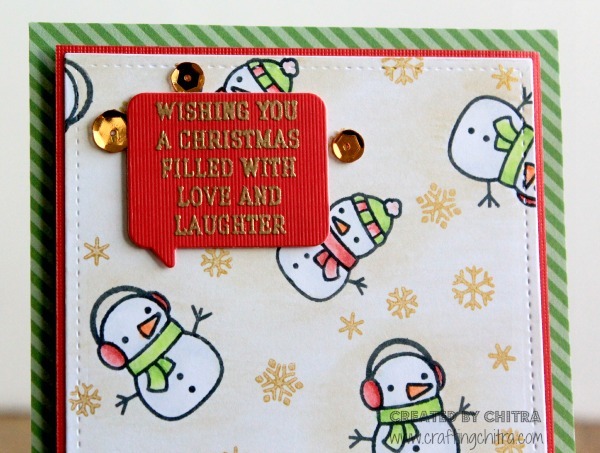 The sentiment is from Hero Arts “Joy To The World” which is stamped using watermark ink and embossed using gold embossing powder. The printed paper is from Lawn Fawns “Lets Bokeh” which is directly adhered to a white card base; the colored panel is adhered using foam sheet and the sentiment is adhered using foam squares. Lastly I added few sequins. Hope you liked my card and got inspired to get crafty.